One of my favorite memories as a child is hearing my dad roam throughout the house whistling Christmas songs — in July! I love Christmas music, and even though it may bring strange looks from others, I think it is appropriate at any time of the year. It is kinda hard to imagine snow or the weather being ‘frightful’ when it is 95 degrees outside, but Christmas music is such cheerful music and that is why I love it! This July I find myself working on two Christmas projects. The first project was a Christmas sweater for my son. 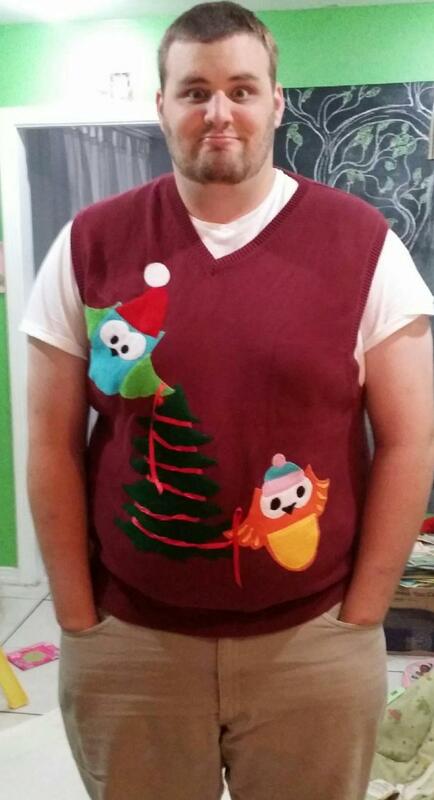 He was invited to a Christmas in July party and needed an ugly Christmas sweater. When I heard his request, my first thought was where am I supposed to find a Christmas sweater in July. My second thought was that was a great business idea! Start a website selling ugly sweaters for those times when someone really needs one and didn’t keep that last one they received as a gift. As it turns out, there are already several websites with ugly sweaters. Darn, someone beat me to a great business idea again! And did I buy a sweater from one of those websites? Nope! So much for that business idea! Actually, it was because no one carried the size that I needed. My son wears a XXLT. So instead I went to the local thrift store and found a sweater vest. Not ugly, but certainly nothing a 21 year old is going to wear. He requested it to look like a ‘sweet old granny’ made it. His words — not mine. Well, I’m sweet and I’m a grandma, but I will not claim old! I figured two-out-of-three was not bad. My first thought was to sew some ornaments and ribbon in a meandering pattern all over it and just make it really tacky in general. But I decided to be nice and instead I cut owls and a tree out of felt and appliqued it onto the sweater. The owls are stringing ribbon around the tree and decorating their Christmas tree. I think it’s adorable! He said he liked it too! The second Christmas in July project I am working on is the Peppermint Candy table runner and/or wall hanging by Claudia’s Creations. I saw this last year and didn’t think I would find the time to make it, and then a group I regularly sew with monthly decided to do it. So, I jumped in with both feet and decided I could fit it in with all my other projects. Honestly, I just love it and can’t wait for it to be done. What are you currently working on? I’d love to hear about your projects. This entry was posted in Quilting/Sewing, Uncategorized and tagged candy cane, Christmas, embroidery, hanging, party, peppermint, quilt, quilting, runner, sweater, table, ugly, wall by monkeyneedle. Bookmark the permalink. I guess it’s Christmas in June and July for me. In June I finished a postage stamp Christmas quilt and I have about 12″ of binding left to sew on a charm square Christmas quilt. It will be so nice when Christmas rolls around and I have new quilts to use. LOVE that vest. My son (24) would totally rock it also. Great job. Wow! A postage stamp quilt? I can’t even imagine how long that must have taken to make. One day, I might make one too… I’d love to see yours? Do you have a blog? I don’t have a blog but here’s a picture. It took a while to make and I probably won’t use the single square method again. I’ll make another some day but I’ll make patch blocks. 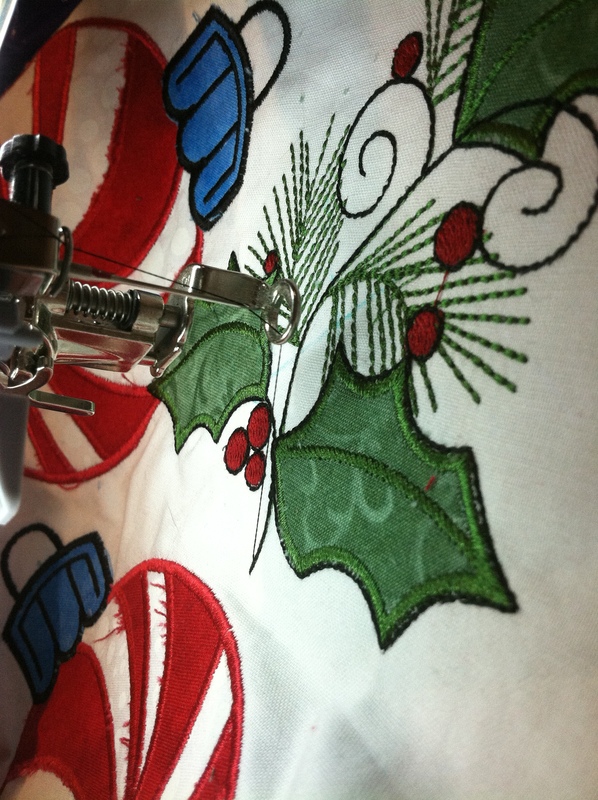 But I started yet another Christmas quilt last night at Sew-in. This one is a wave pattern. It must be Christmas in August!